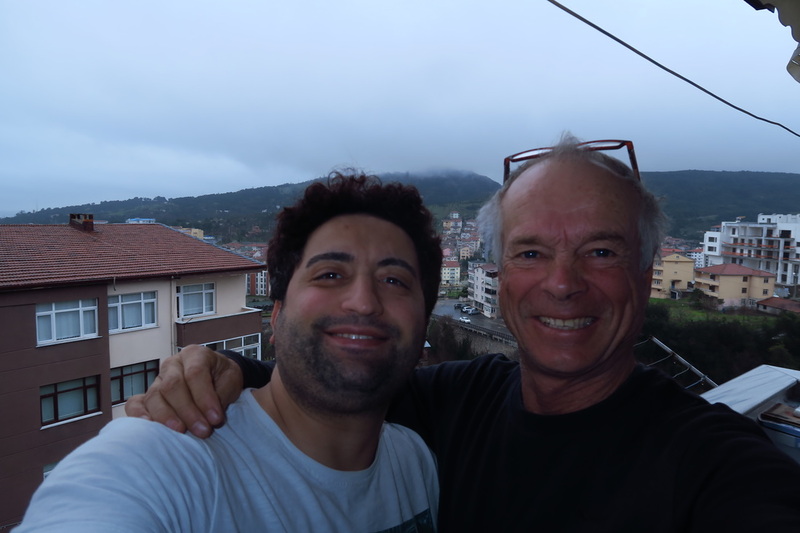 Leaving Suleymans apartment in Uskudar with the market owner next door. My source of fresh bread whilst there. 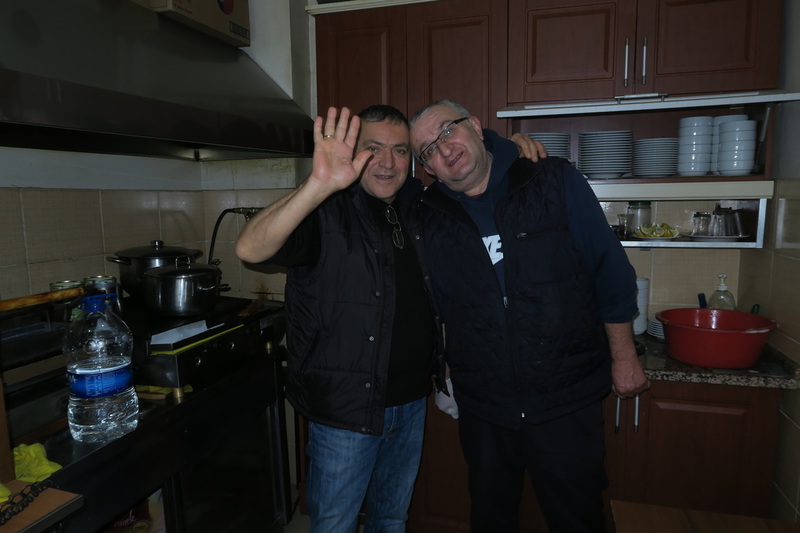 Having an authentic Black Sea meal with Emin in Bagirganli. We had a great afternoon together talking boats and other stuff. Full of anticipation and excitement I was ready to go at about 0830, Suleyman was leaving early so I had to take my gear down bit by bit and leave it with the store owner whilst I went up for more. Ready to go about 0900, a few pics were taken. Once again it was a mild overcast day. 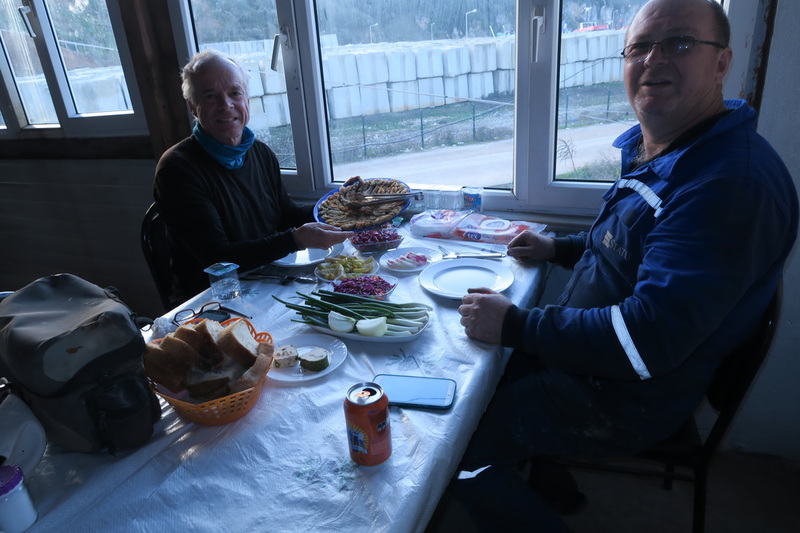 I stopped down below in the main street for my last meal in the Yemek evi, with the guys who have been feeding me for the last month. Leaving here the road to me down to the water front here a right turn north was made. It was a great ride along the Bosphorous. Passing underthe two huge suspension bridges, firstly the Bogazic bridge, then theFaith Sultan Mehmet , these bridges are huge. It was busy on the narrow road, however I had now real proplems with fellow road users. 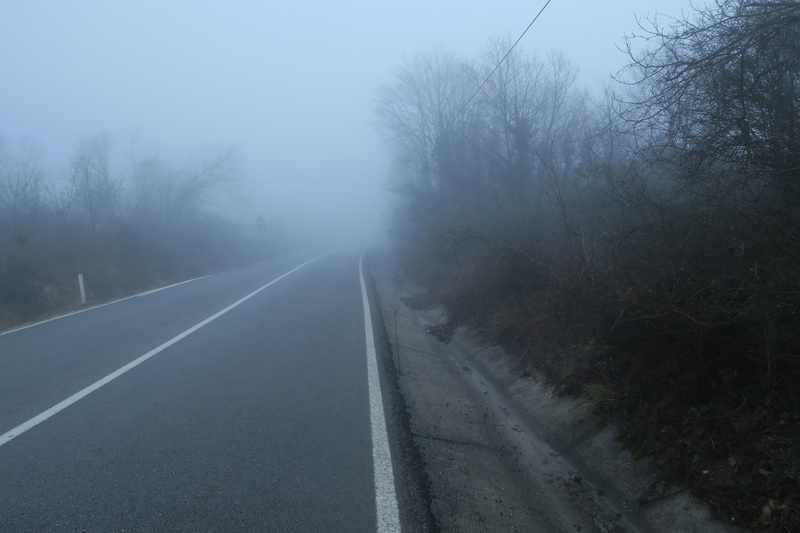 Near Beykoz my left pedal started clicking. I let it be, then decided to check it out. Nothing could be done to adjust the bearings. I rode on in two minds as to what do about it. 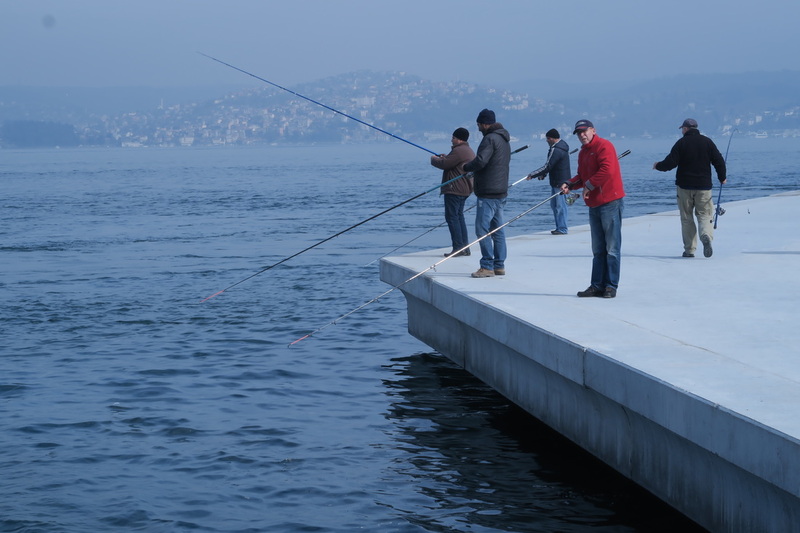 It was a pleasure riding along the Bosphorus, there were men fishing at many locations and all manner of small craft moored in small channels. 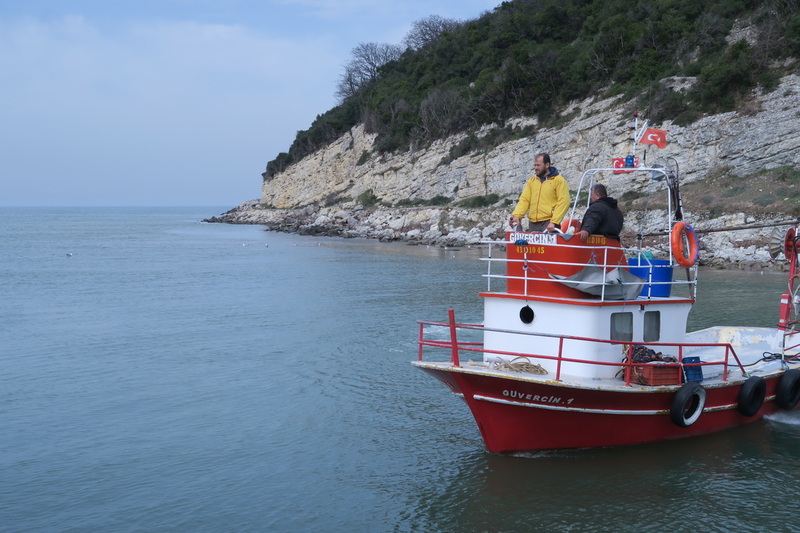 A vessel was even seen along the shores with a ribbed conveyer scooping flotsam from from the Bosphorus. Once turning away from the water at Beykoz the climbing commenced, nothing to steep but constant, near the top a tunnel was ridden through. It was incredibly noisy inside. I thought I had missed a turn to Riva and went back through it, had not and had to ride it for a third time. This road climbed and then descended into more rural land. That of deciduous trees. The pedal was still clicking. To put up with this for months was not on. 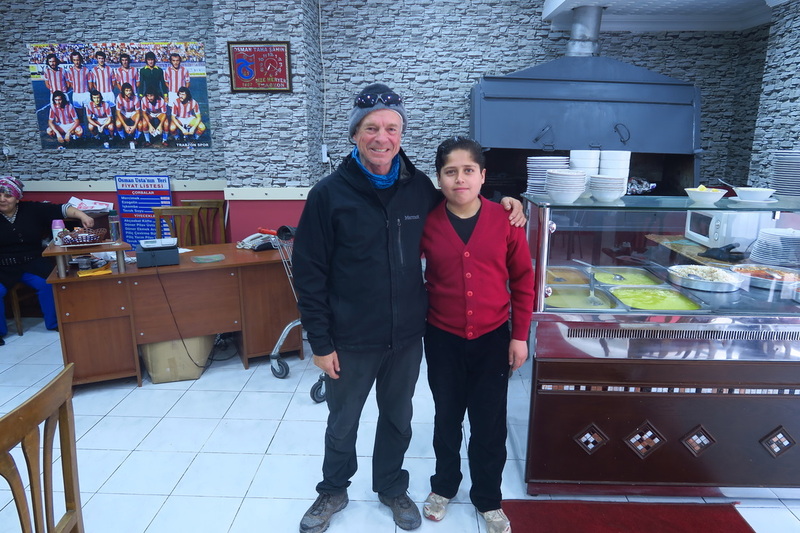 I stopped for lunch in a small restaurant down the slope to the Mahmut Sevket Pasa. From here, it was a small climb then a descent into the village. Here I asked if there was a pension. No was the answer. I now made the decision to return to Istanbul and get this annoying problem fixed. The bike shop was open till 1900. I could make it. All day I had been sweating in my Ice Breaker base layer and Icebreaker tee shirt,. Only to be cold down the hills in the fresh air. Without rushing I slowly backtracked. Once back on the main road I managed to hail a Dolmush down. It was a rural type wagon, An aisle down the middle. We man handled the bike in. 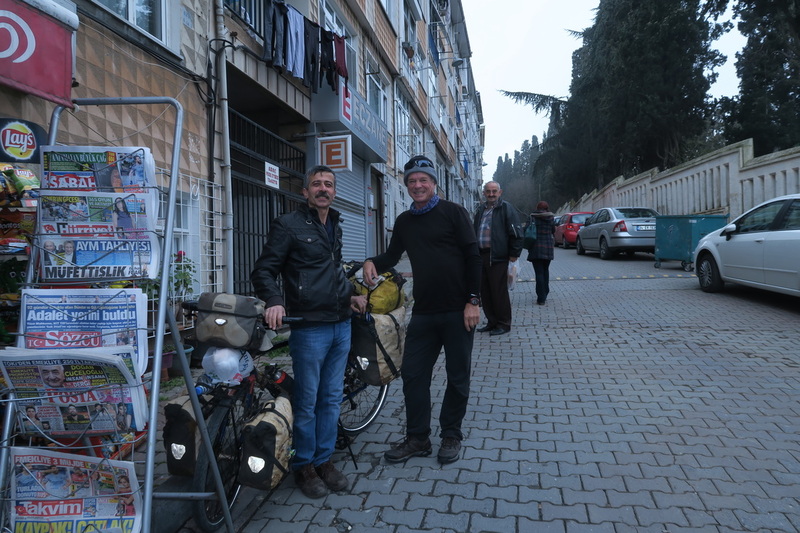 They took me to Beykoz, here I kept riding and met up with a local cyclist, we rode together until Ukudar. By now I was quite worn out. For my first day back this was big. Peak hour traffic was in full swing. The light was fading I put my rear light on and used the GPS to continue. Energy levels were so low that a stop was made to eat some bread and Nutella. Peanut butter is $20 a jar, if you can find it . Finall y I got to Bisiklet Gezgini, here Secil let me park the bike in the shop for the night . After she closed the shop we caught a mini bus back to Kadikoy. Here I walked up to Cath and Evens house. Evan and I both said we are sure to catch up again. Here we were catching up again 10 hours later. We ordered home delivery kebabs and then went on to meet friends of hteirs at a busy bar in bar street. There was a great bunch of young people at our table. We had a great time over drinks until one in the morning. Walking home a heavy down pour was in progress. We all felt like we had been smoking for the night. My throat was sore and my close stunk. On the Saturday I went back to the bike shop, here I took the bike for a ride with the new pedals on it. Everything was fine, thankfully . I was always having trouble replacing the cable in my MSR Whisperlite stove. This time I could not get the last 10mm of the cable back in the fuel line. This stove has lasted me nearly five years. I did not want to risk having this problem once leaving Istanbul. Alex had plenty of them in stock so a new one was purchased. I spent the afternoon in the shop just chatting. That evenining Evan cooked up a brilliant chicken pie which was followed by icecream and a movie. The first movie we watched was engrossing. Called “Slow West”, much of it was filmed on my sister and her husbands farm Ben Ohau Station in the McKenzie basin in NZ. The first instalment of Lord of the Rings had some scenes filmed there also. My time with Evan and Cath on and off whilst in Istanbul was so relaxing and enjoyable. It was so nice to spend time with them outside of the environment of my home town. Unlike many people I know at home, they have thrown caution to the wind and are experiencing the richness of another culture and its people. Good on them. I got away from Evan and Caths at 0830, well rest and happy to be leaving again, this time on a Sunday. Traffic was a lot quiter, infact, it was a pleasure to be riding the same route, it was so much more relaxing with less traffic. Once out of the city, a stop was made at a fruit stall going up to the tunnel. The guys were growing oranges at Anatolya, they were so sweet and juicy. They offered me a bag full. My bike was heavy enough. They let me eat as many as I could. They mist was setting in, at the top of the ranges it was thick. 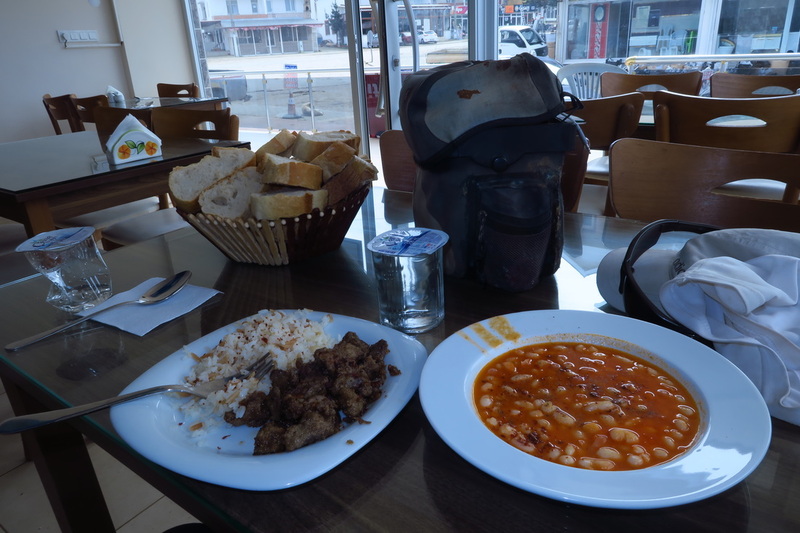 In Mahmut Sevket Pasa, as far as I got the other day, a stop was made for soup and chai. Managing the cold sweat is a problem. I spent money on a good light weight Arcteryx high tech jacket. As soon as I stop I put this on to stop getting cold. It works perfectly. I am still getting my road fitness, so going was slow in the hill country. Along the way were dozens of dogs living in groups. I say groups not packs as they were not hunters. They looked sad and were timid. They have been dump by people from Istanbul. It is sad. People drive up to feed them, there are also rough kennels built for them in the bush. The landscape is all forested in small deciduous trees and blackberry is common on the roadside. It is all rather bleak. Nearing the top of one range there were shot gun blasts every minute or so it was a bit scary. Anyway near the top it was found to be a clay bird club. I stopped outside and was getting pellets falling on me as they came through the trees. I had to laugh . 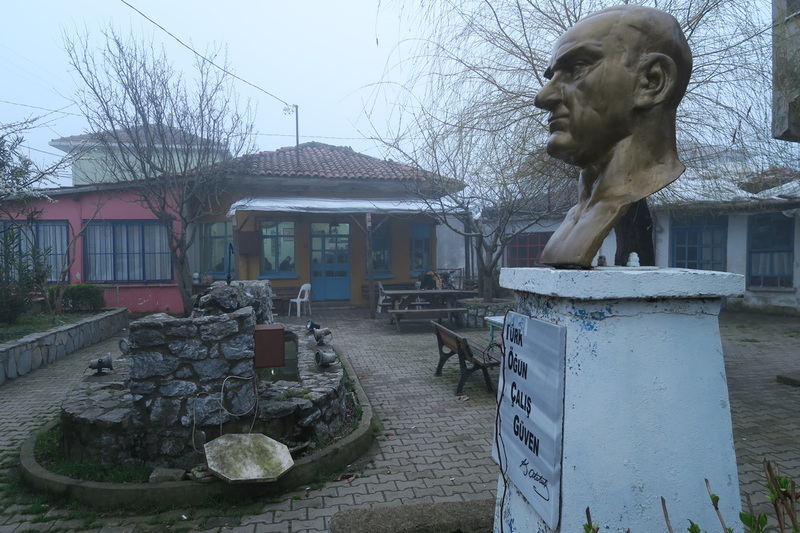 About three in the afternoon in thick mist o pulled into Kilici for a çay. Chatting with all the guys as best I could, they said there was a man over the road that spoke English. I yelled out to him and said I would be over soon. Ahmet was a great guy. 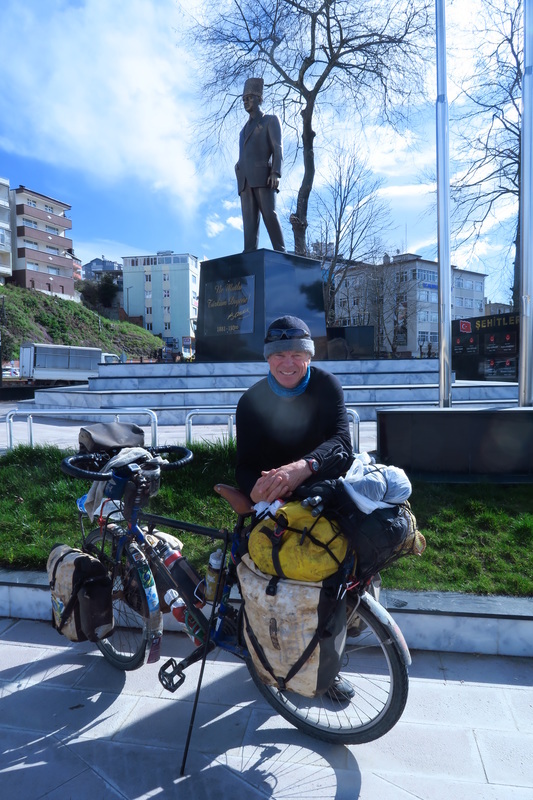 He was running his dads Kahve hane for winter and guides tourists in summer. I stopped here and drank chai all afternoon and ate food that a man from Istanbul bought up. Everyone was so friendly. These “gentlemn clubs” are everywhere. Men play cards, backgammon and a game called OK. They generally just come to these places to be social. The mosque across the road had clean toilets and showers. The imam called during the evening, the men just wandered over and came back after prayers. It was a great experience to be with these people sharing a little of one aspect of their lives. Ahmet said I could sleep in a room adjoining. I set up on the floor and had a good nights sleep. It was great to be getting back to normal again. Leaving about 0830, it was straight into heavy mist, visibility was no more than 50m. Riding was easy for a time. I was told about the relentless hills here. They do not bother me, I enjoy riding amongst this kind of terrain, at least one does not have to pedal all the way, unlike flat country. Water is available at many points along the road. It is spring water and very cool. I stopped at one village for bread and cheese, that Ahment had given me. There are few people about, this time of year the road is very quite. Many restaurants are closed. I arrived at the coast before Sile but stopped at Sile and had lunch in a popular eatery. Here a rubber tipped pen for my phone was bought. It saves me taking off my gloves all the time when using the phone to check my position etc. The hills continued relentlessly, there was a huge new bridge being constructed near Akcakse. Near this new road they are building there have been these enormous pipes stacked along the line they are to be layed. 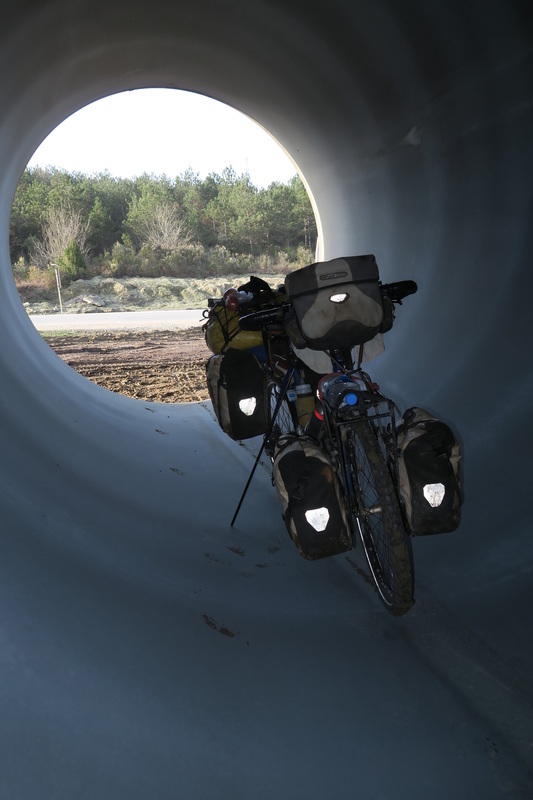 These pipes are so big my bike could easily be wheeled within. They would be perfect for camping should the need arise. 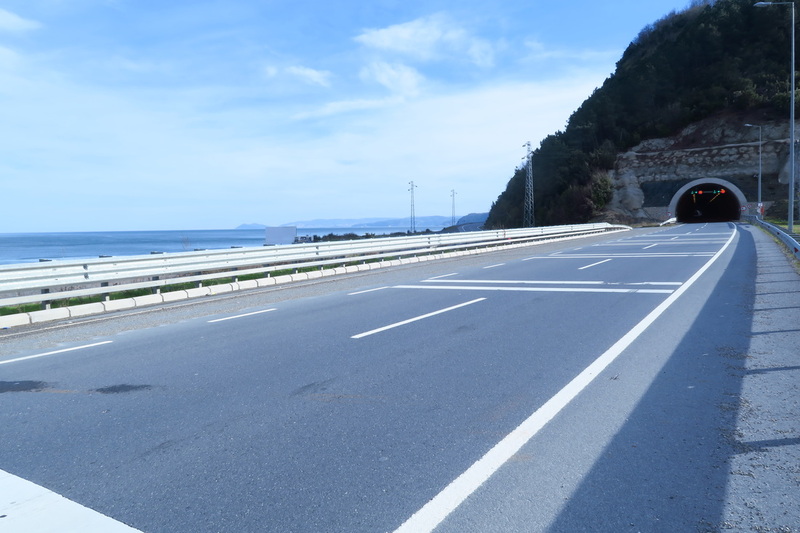 The road seems to leave the coast and then most unexpectedly the coast is reached again. Nearing 1630. I asked some builders if I cold camp in the house they were building. They told me the police are not too keen on this. Up in the village Karaca, I was looking around for a place to camp. A man on the street was approached he turned out to be the imam from the local mosque. He allowed me to camp in an area adjacent the mosque. It had fesh water and a toilet. It was great. Another man came along and asked if I wanted to come to his house foe a shower and watch the football. All this in Turkish I might add. I use the translator when I can. It took me half an hour to tell him I could not leave my gear. The mist set in again. This prompted me to cook dinner in the toilets. Really there was no other choice as outside the mist was soaking everything. This was a perfect opportunity to check the camping gear in this rather cold weather. I was expecting a heavy overnight dew with condensation all through the inside of the tent . Life was getting back to normal. The pasta was great. As soon as I hit the tent it was not long before sleep came . I woke up and thought I had been sleeping all night, it was only midnight!! I felt safe here. 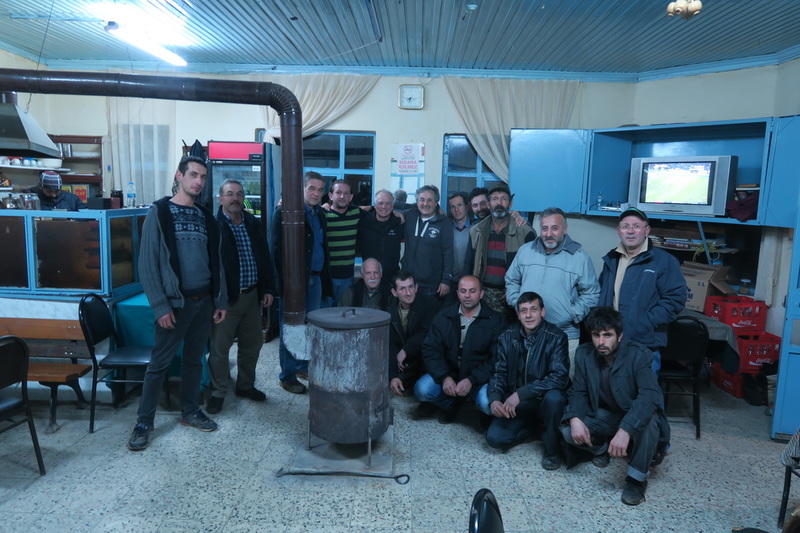 The Turkish rural people like most of their city cousins are incredibly friendly. Some older people hearing English just walk away, though few do this. As usual I always tether my bike to the tent with occy straps. 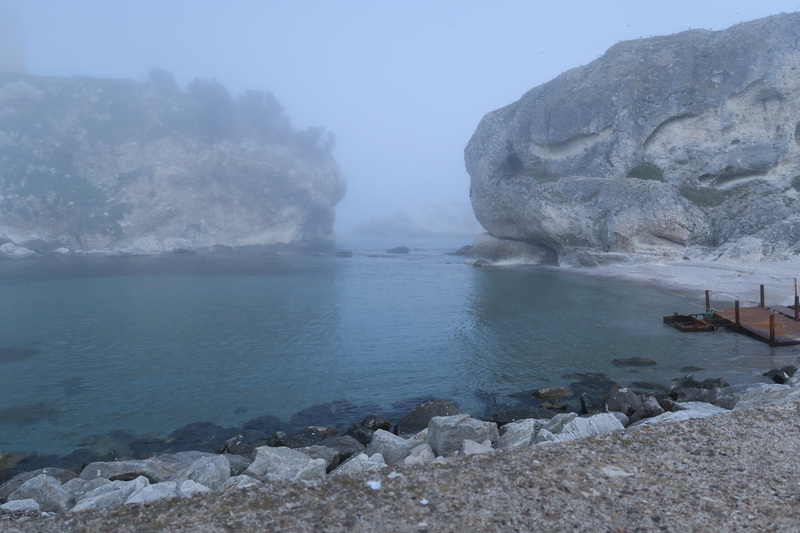 I could not believe it in the morning what had been mist the night before was now clear with a view of the Black Sea and the tent was almost dry. I had eaten breakfast and was ready to leave by 0830. I went to see the Imam but he was not about. A note was left to thank him. The hills today were very steep and many. All the way to Aĝva some 10km east. Here was another lovely coastal town with few tourists. Time was spent here having sandwiches and fruit t the water front. As usual there were stray dogs everywhere. Again, they were timid, unlike their cyclist hungry kin in Peru. Leaving here, at 1200 with only 10 km ridden it was going to be a lazy day in the warming sun. I was riding with just a tee shirt on and a peak hat it was that warm . 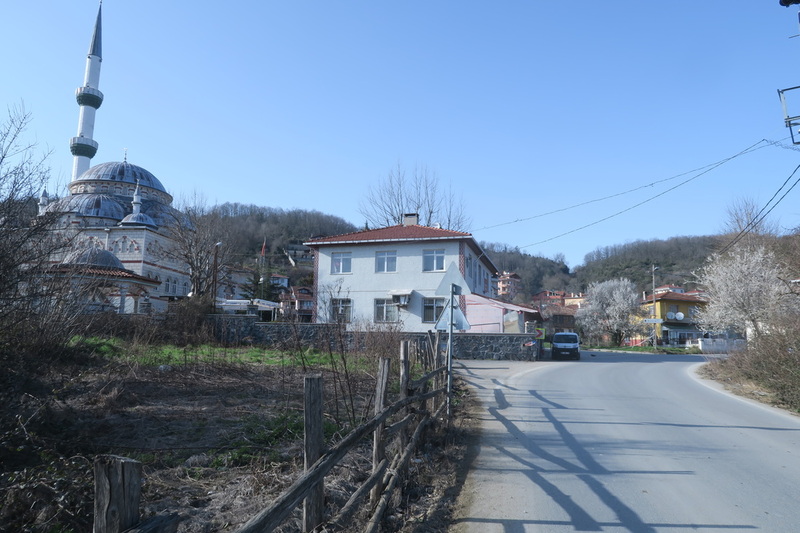 I took a tertiary road to Kadikoy and other villages. The road was even quiter out here. The villages were frequent and very rural. A stop was made at Panali for chai. Here it was only half lira. Unlike Istanbul where I paid up to 3 TL in Kadikoy. 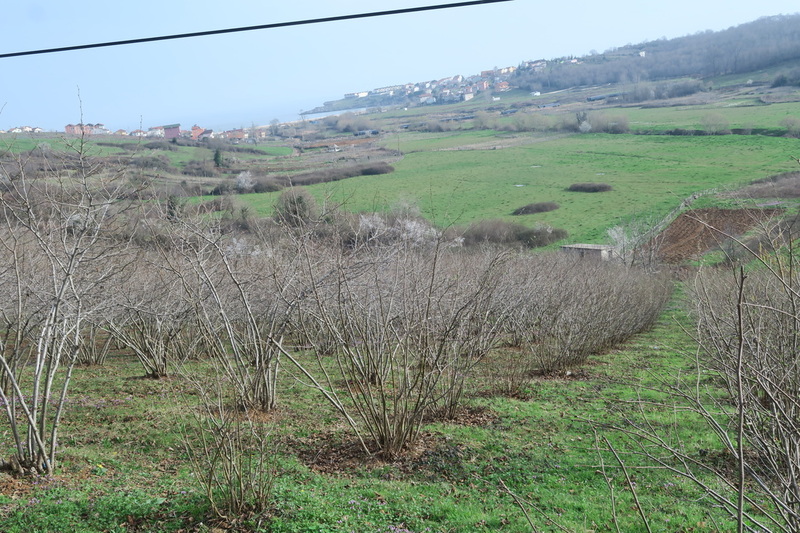 The countryside was more rural now with farmers working in their hazelnut plantations. I am told they are everywhere along this coast. The road deteriorated to dirt along here. They are rebuilding it. I stopped for an orange and noticed the rear tyre was going down. This was repaired. 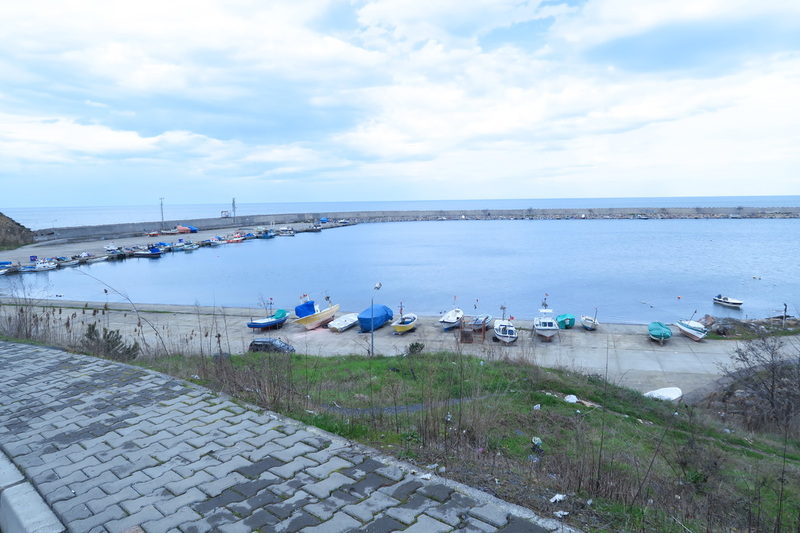 Passing more hazelnut plantations, I suddenly dropped down to the coast and a fishing harbour. I stopped here and had a coke at the restaurant and spoke with two other local cyclists. I then went for a ride down to the harbour. Here there were many boats on hard. 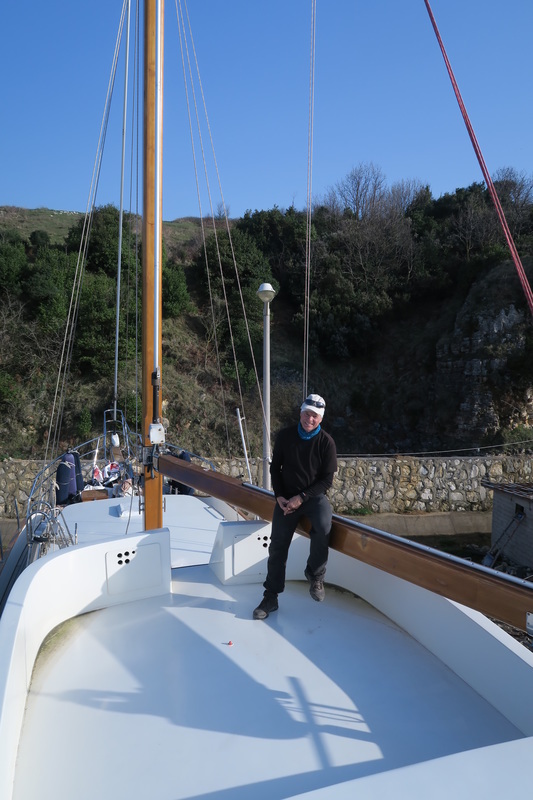 One lovely full keel yacht caught my eye. I was looking at her when a guy said hi from another boat and would I like to take a look onboard. Emin took me onboard and we talked boats all afternoon. I then went for a ride to the end of the breakwall. It was a real working harbour. Emin asked if I would like to eat with him in the restaurant. Here we enjoyed salad and fried whole local fish. It was such a nice meal. Emin could speak some English. He said I could sleep on his boat. 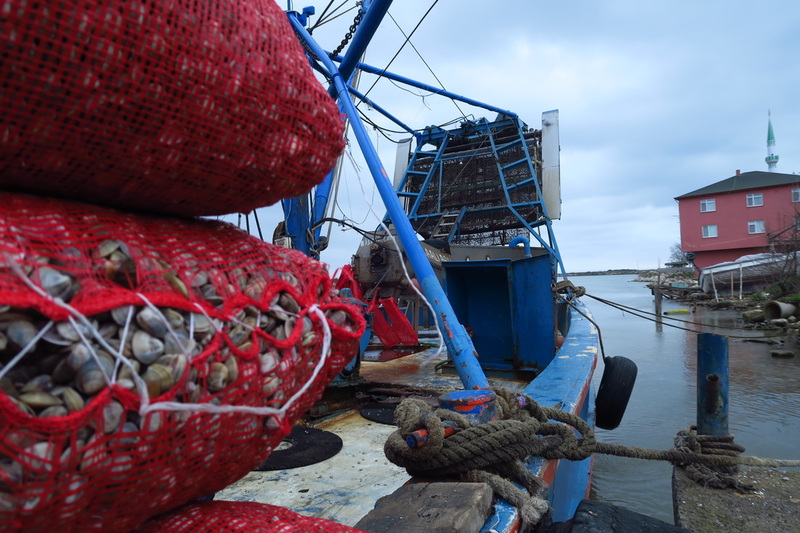 Anyway after dinner and nearly dark we went to the fishermens coop, here they said I could sleep. They said I could sleep on a lounge in the main area. I declined as it was just filled with smoke. Instead I pitched my tent in the foyer. The night was spent typing this. Emin was such a nice guy we got on really well. He was off to Istanbul, a two hour drive tonight to see his mother who is not very well. The club was a great place out of the weather to dry things agains. The Turkish hospitality has been overwhelming. I get offered Çay everywhere I go. People always ask my age. Today was so enjoying in the almost summer like weather. I stopped every chance I got to talk with people and look at things. The construction trucks drivers on the road all wave as they move gravel from one place to another. They apart from tractors and the odd car are all using the road. A filling fell from my tooth tonight it is very painful this will have to be sorted out ASAP. Later in the evening I decided to sleep in the heated area on a lounge. The smell of smoke was thick but it was warm. Plus my gear would get a chance to dry out. This is quite a problem accentuated by the damp air. Anyway, needless to say I slept very well. I was up early and cooked breakfast outside on one of the tables. It was invigorating to see the early sun light illuminating the many boats in the marina. 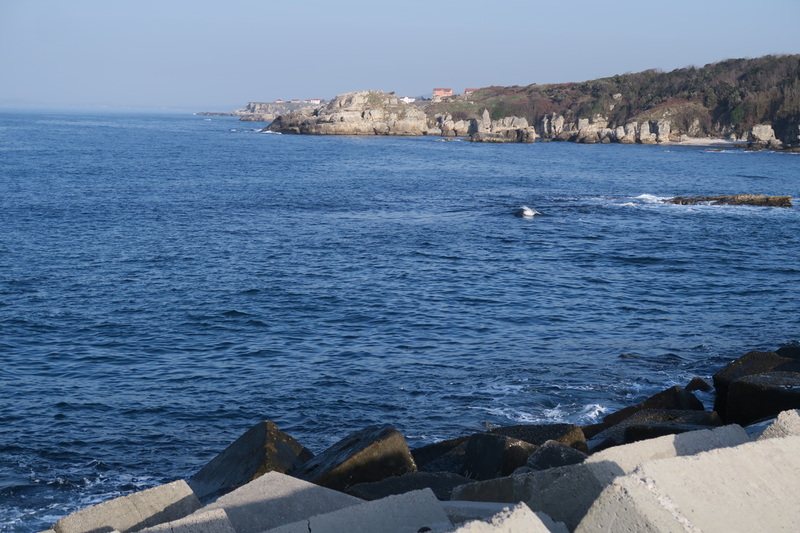 These Black Sea harbours are a great place to come and slip a yacht for repairs. They are so under utilized. Leaving about 0800, it was a steady climb out of the bay and back into the rolling hills mostly planted with Hazelnuts. Farmers are now in the orchards pruning out the weak growths. The rain started about midday. I got out my waterproof over pants. These were put over my longs. My coat was also put on. Stretch skull cap and woollen beany with gloves according to temperature. This seems to work well for me. I have a new Arcteryx Atom jacket to keep warm when camping and another set of IB woollens. I really feel the cold so am carrying plenty of winter gear. I often sleep in woollen longjohns. I also wear my Marmot minimalist raincoat whenever necessary. I also have a sea to Summit sleeping bag liner which most definetly adds another few degrees to my sleeping bags min comfortable temperature . On arrival at Kandira a stop at the markets was made and some fresh bananas bought .These are very expensive here, but I love them . A stop was made for Çay and bread at a bakery. Riding up one hill on the main road a man was driving one of these little rural tractor type vehicles. His brakes failed and he ploughed into the drain and cutiing. I was still down the road a way. People stopped to help him. He was injured quite badly. Poor guy .I continued on there was nothing I could do to help. 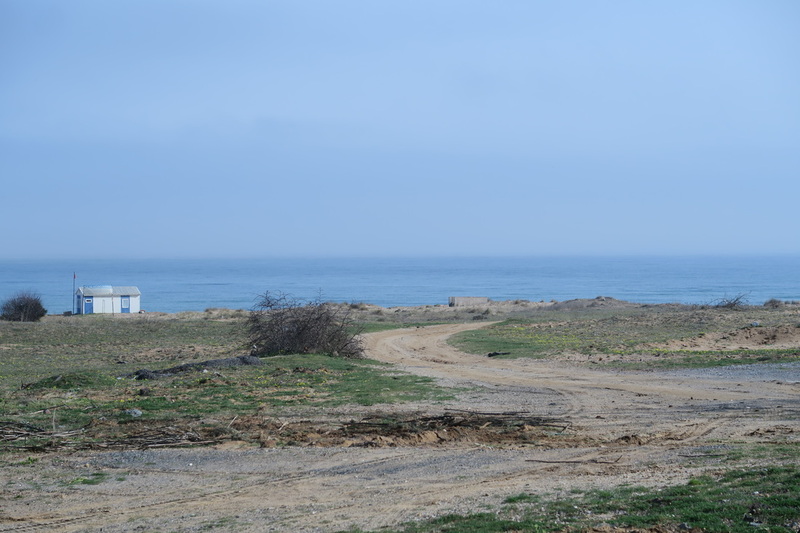 The road now came close to the sea again with little villages and bays everywhere. All were deserted eccept for a few locals. 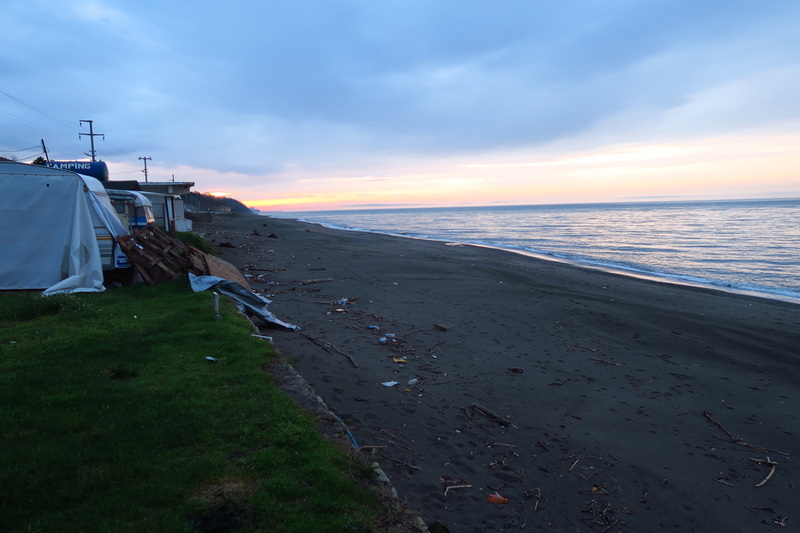 The sea was dead flat and forecasted as having a temperature of 10 degrees. 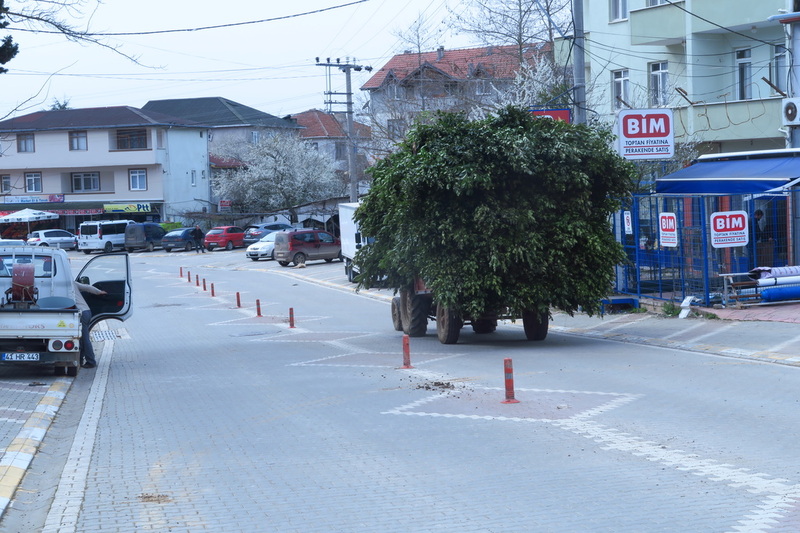 Tractors of freshly cut çay were seen on the roads in some small villages, the aroma of the freshly cut plants wasvery enticing. In Kurtye I stopped at the only open cafe and had fried liver of lamb and rice. Leaving here the road took me into some very rural areas on dirt roads. It was pleasure to just be ambling along in this most rural of environments, very few people were encountered . Everything is a shade of green and grey through to black. Everything is very wet . Getting to the one shop village of Cametepe, I bought yoghurt and asked the owner if I could camp somewhere on his property he was not to keen .I had to move on. It was now getting close to dark and very damp and cold. Never enough to dampen my enthusiasm. Even the large pipes had been buried along this section so there was no chance of sleeping in one of them. 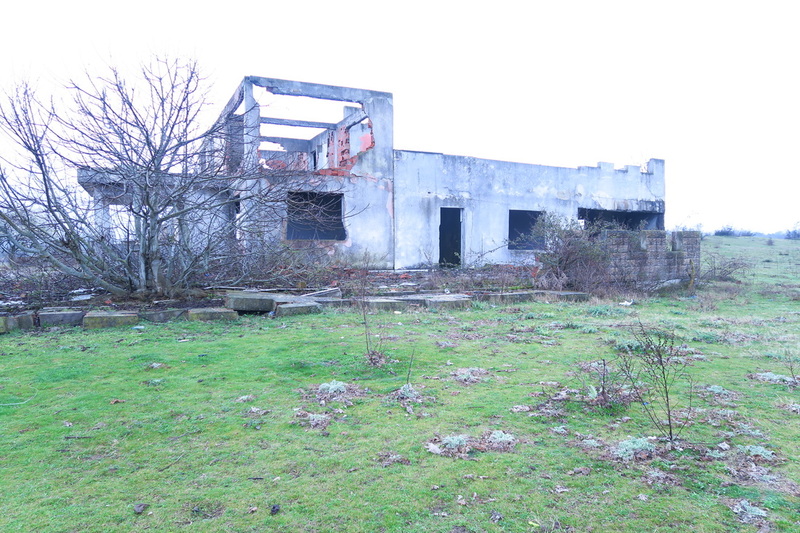 Further up on my left was a track leading into an old derelict house. Investigation found it to be suitable for camping. I found a small room with just enough room to set up my tent . Not hungry just a couple of cups of tea were made. I had to be careful with my light as some vehicles were passing on the dirt track. I am sure they would not have cared, but it is best not to be seen . My string line was put up and all my wet gear hung up . It was a very humble little camp in what must have been a palatial home in its day. The floors even in this little room under the stairs had marble floors. Vandals had been over the place. I felt safe here which mattered the most. Sleep came easy . Once again wet clothes had to put on. Though the wool only takes minutes to warm up . Breakfast was bread and tomatoes. The Turkish make just the best bread rolls. It was not far to Karasu. Here I found a restaurant and had 3 bowls of soup and two bowls of chicken stew. It was so nice and warm in my stomack. In the little cafe was a well groomed young boy Halit. He was a Syrian refugee. He could onlty speak Arabic. This reality got me quite emotional. The harsh reality of this crisis was before me. I had to find a tissue to clear my eyes .Young Halit had such a positive smile. All the water on the roads was getting thrown onto my shoes as the front mudflap had fallen off sometime in Namibia. I got directions to a moto shop, here a plastic bottle was cut to shape and the guys lent me a drill to fit it with some screws I had bought . No one here speaks English so I get by with some phrases given to me by Cath and Evan also Suleyman they have been so helpful . Once this was fitted the water was much less of a problem . The road from here was almost flat for 40km. It made a great change. I have a lot of weight onboard for this trip and have so far ridden up all hills, though ret regularly, afterall I have plenty of time. It is also early in the journey, my fitness has a long way to go. At the top of one hill a stop at at çay house was made. Here çay is only .75TL a glass. All the local guys came for a chat. Or at least we tried . 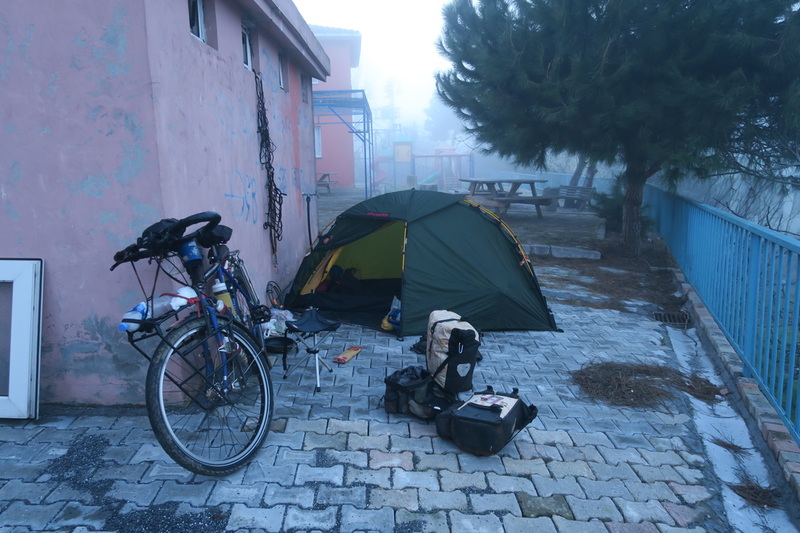 On arrival at Akoçakoca, I stopped for yoghurt and bought some potatoes for the night to fry. I stopped at a hotel and asked the price they said TL60, it was far to much plus the room was up in a lift and they would not let me take the bike up. Riding on the road got very close to the sea again. There was a camping area on the obeach front. Riding on I found gap in the guard rail and went into the park. It was completely deserted. In here an enclosed awning was entered. In here was even a bed. I was very lucky having this waterfront accommodation. There was even a subtly beautiful sunset looking back towards Istanbul over the black Sea. I cooked my potatoes in the fry pan with lots of garlic and climbed onto the bed and fell aseep. Earlier my tent had been hung up along with all my very wet clothes. My little cabin had been just the best place, the sound of the gentle waves had made for an excellent sleep. I stopped at a petrol station roadhouse and had soup and an omelette. The road was flat again. Riding was still along the seaside. From here interestingly the west bound side of the road went through no fewer than twelve well lit road tunnels. It is so noisy in these when other vehicles are within, especially trucks. I had all day to ride the 34 km to Ereĝli. Arrangments had been made to stay with a Warmshowers host Heraclia, he was going to meet me at 1500, so I had all day. Some adjustments were made to my new mudflap, as water was still spraying onto my right shoe . Next stop was the seaside city of Alepli. Here time was spent in the riverside parks, just enjoying the sun and some yoghurt . Like most public places there was a statue of Ataaturk. A national hero. Ereĝlia was an industrial city. 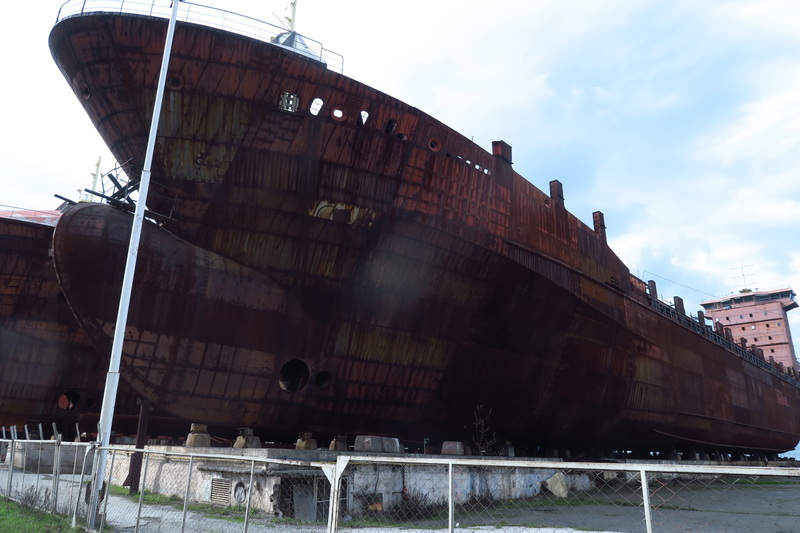 There were half completed ships in a shipyard near the road. It had been impacted by the GFC. There are two blast furnaces here that use Brazillian coal to produce steel . In town I had lunch at a cafe and visited the large Migros store in an effort to find some breakfast cereal and milk powder which are both hard to find. After lunch, it was decided to get some dental work done. I asked around for a Dişçi. It took awhile but a modern practice was found. Here three fillings were repaired for TL300 which was good value I thought. It felt good to have had this done. Heraclia met me here and we rode to his apartment which was nearby. He lived 6 floors up. Once here it was a priority to shower. It felt so good .We enjoyed a home cooked chicken dish and my washing was attended to . Heraclia spoke some English but not to fluently. We used the translator to clarify ourselves. I made sure all my gear was charging and hung the tent out to dry .It was great to be here. The weekend forecast is for more rain. It was so nice to be cosy with great sea views from his apartment . Second departure. 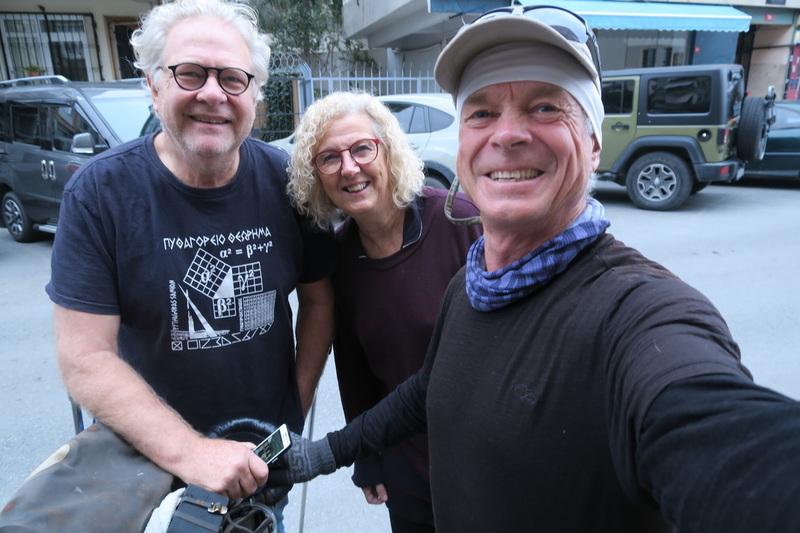 The three of us had such an enjoyble, relaxing and fun time in Istanbul together. Thanks you guys!! Kadikoy. 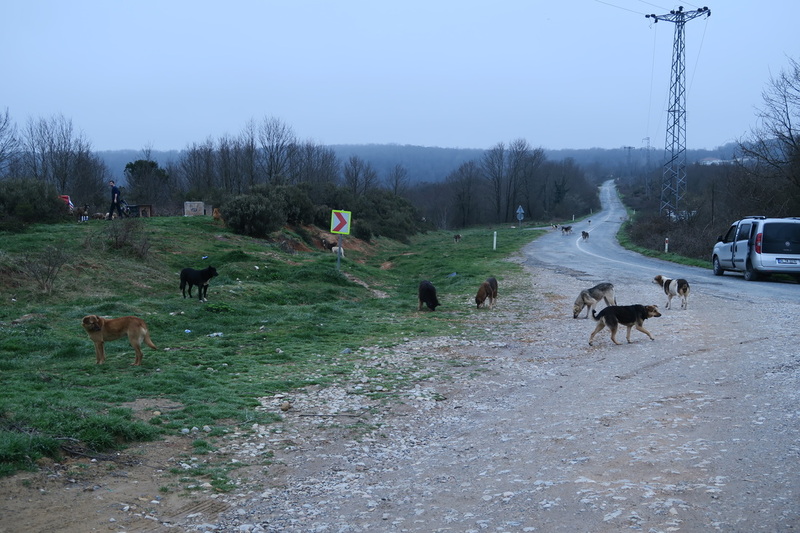 The unwanted dogs of Istanbul. Sad, but at least someone looks after them. They were all timid and looked sad. Ahmets cay house and my stop for hte night. Ataturks bust in the foreground . The crew at Ahments cafe, Ahmet to the left of me.